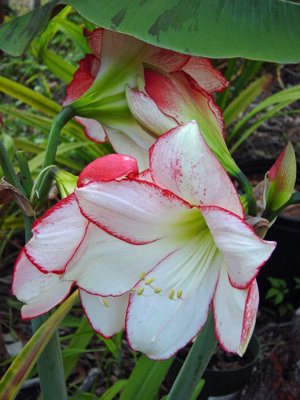 Amaryllis are spectacular trumpet shaped flowers that grow on top of a tall hollow stalk from large bulbs. They come in a large range of colors including red, pink, orange, purple, white and variegated. They tend to bloom in late winter or early spring. They look best in large clumps or groups. The bulbs are best planted with their necks above ground in rich sandy well drained soil, and plenty of full sun to part shade. New bulblets are produced alongside the main bulb. The leaves are long erect green strap like. Newly planted bulbs should be watered to let the soil settle, then refrain from watering until new leaves appear. Also refrain from watering during the dormant period. Leaves may be removed at this time. 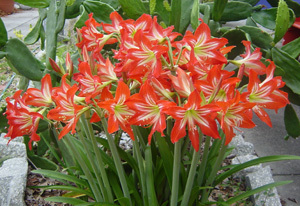 These showy plants can be forced to bloom indoors after placing the potted bulbs in a sunny spot. Water every other day and fertilize every other week.